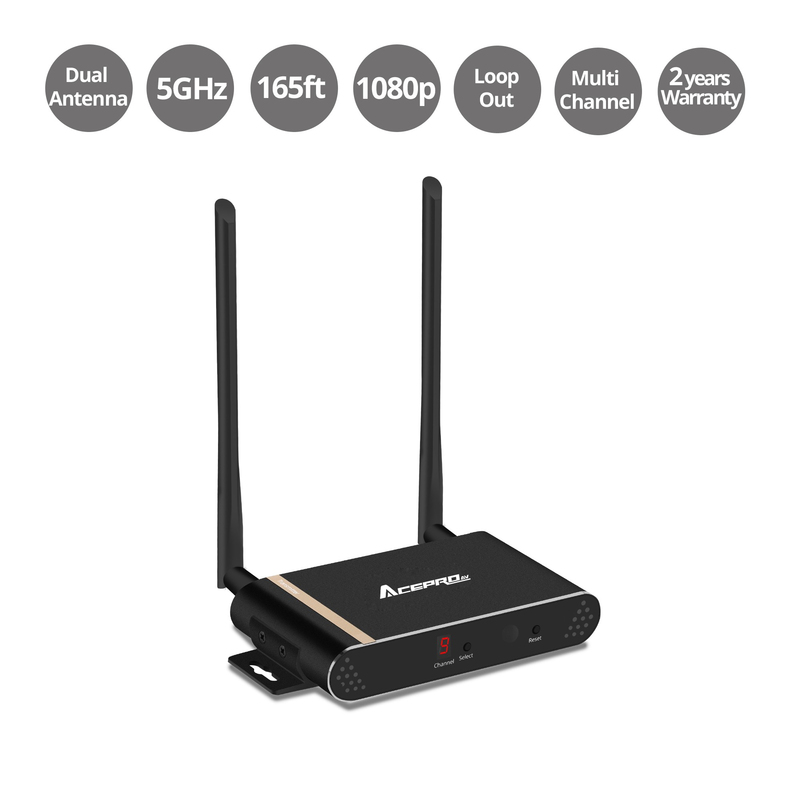 A Wireless HDMI Extender is a great equipment to have in the work place if you’re looking to create a user friendly environment to display video across areas where routing a cable would be difficult or visually displeasing to use. These environments could be in meeting rooms, banquet halls, auditoriums, lounges or stadiums for example. Videos could be played by a computer, laptop, consoles or other disc playing multi-media devices and shown on a TV screen with virtually any size. The table below suggests what resolution is best recommended for different types of multi-media tasks when using a Wireless HDMI extender. 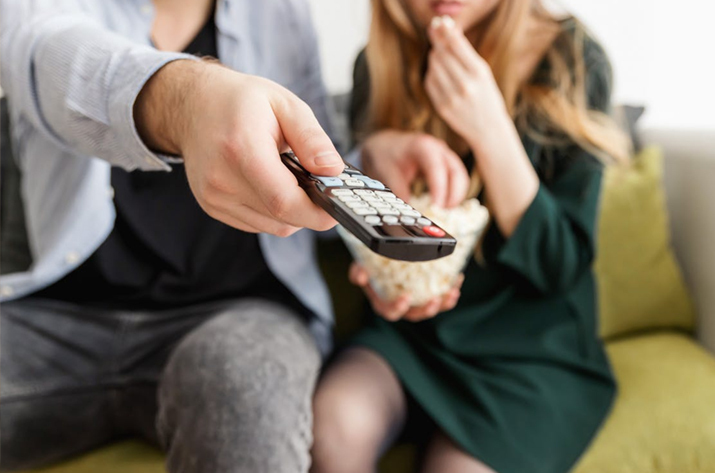 By knowing the type of media consumption you’ll need, you can pick a wireless extender suitable for you as each tier of wireless extender equipment (720p/1080p/2160p) becomes progressively more expensive. The most common options are 2.4 GHz and 5 GHz wireless signals. 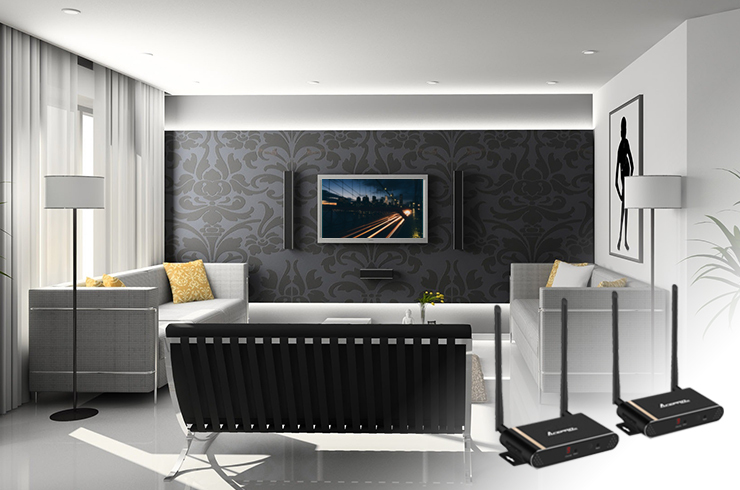 Since 2.4 GHz is used by more devices, a Wireless HDMI extender using a 2.4 GHz wireless signal will become more susceptible to signal interference which may cause stuttering, lags and artifacts when transmitted to the receiving end. A 5 GHz wireless signal is not only stable (direct line of sight); it also delivers more data through its signal due to its higher bandwidth. 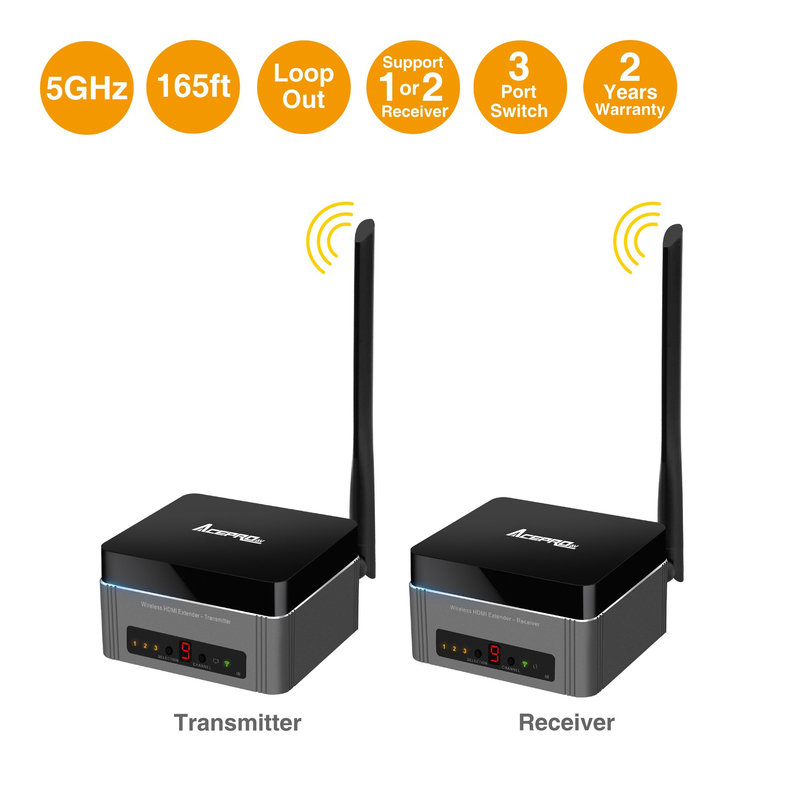 It is an added bonus for wireless extenders to supports multi-channel wireless frequencies as this will minimize wireless interference the most and provide the most stable signal quality. If the source device you’re using supports HDMI out signals, it is best to get a wireless extender which supports HDMI input signals and also to make sure the correct HDMI cables are used between your source device and transmitting module for each wireless extender as a lower specification cable could bottleneck the data being passed through reducing overall image quality on the output device. 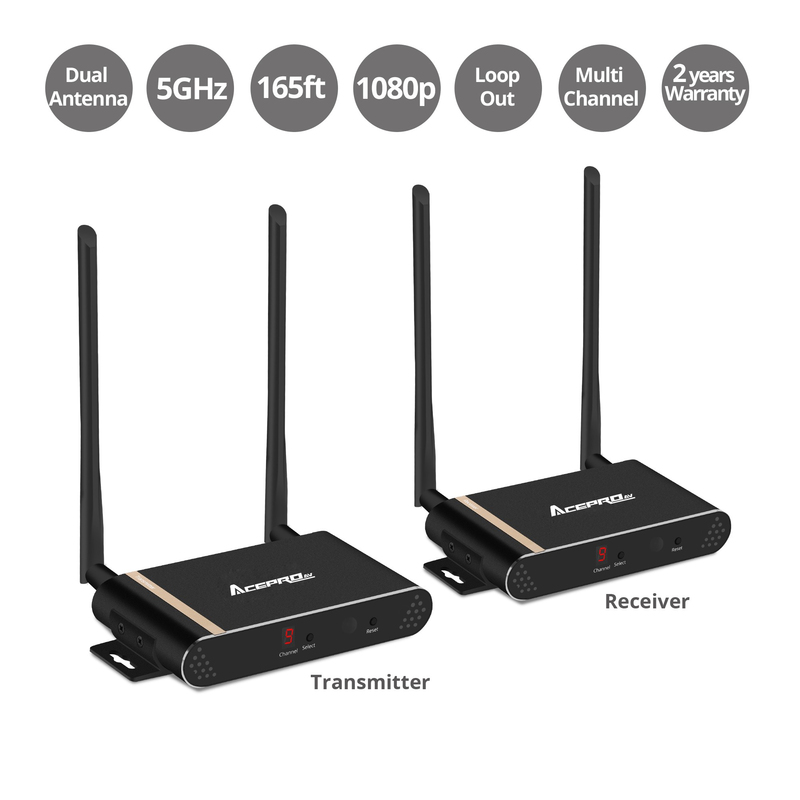 You’ll need to make sure the transmitter and receiver is able to support multiple displays simultaneously as not all wireless extenders can extend images to multiple displays. Check if you are able to purchase a single receiver or if sold together for the transmitter and receiver only. If your source device (such as a Blu-ray player, DVD player, PlayStation, Xbox, Apple TV, Google Chromecast etc.) 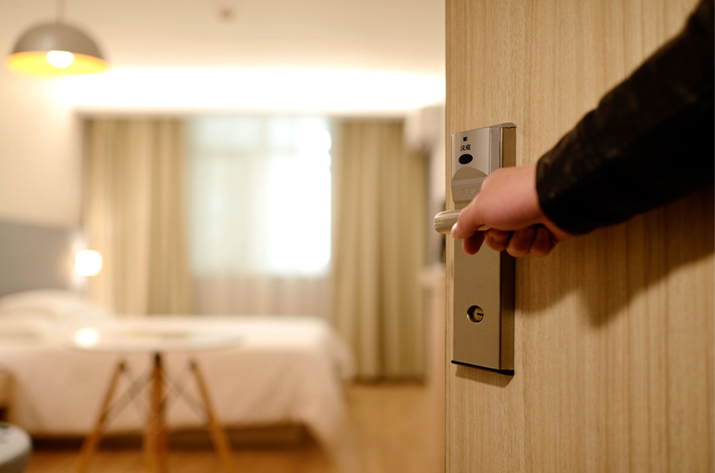 requires a remote control and you wish to extend the display to a place where the remote control cannot control it, then it is best to find a wireless extender which supports an IR extension module to control your source device from your extended output device located in a further area. The broadcasting latency will determine the amount of delay between your transmitter and receiver modules. A wireless latency with a maximum of 200ms would be suitable for most media consumption such as watching videos, doing presentations, looking at pictures or doing some gaming. Wireless extenders are extremely useful equipment’s which can solve the trouble of routing cables across difficult terrains or environments. It is important to consider the factors above when making a purchase to avoid multiple situations which may occur as described above.